Put this in the disturbing column. Thanks, Amazon (AMZN - Get Report) . 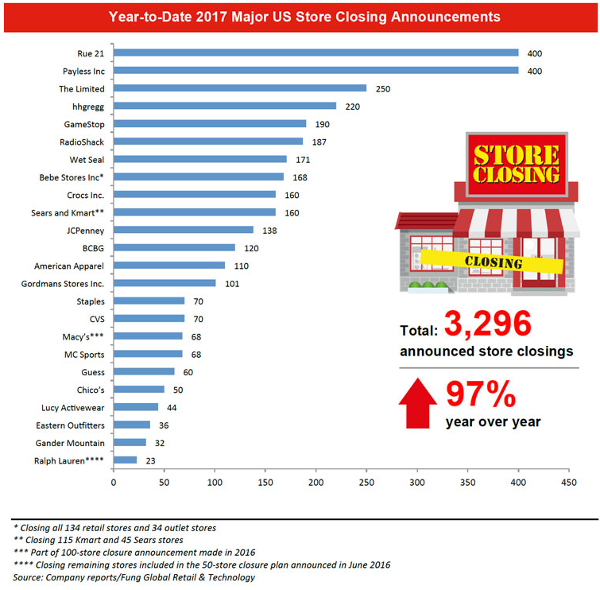 So far in May, announced store closings are nearly twice that of this time last year, while announced openings are up 20 percent, according to new data from global think tank Fun Global Retail & Technology. Overall, closings have been announced for 3,296 stores this year, up a disturbing 97 percent year-over-year. Most of the shuttered stores have comes from the department and specialty store categories. Saying this year has caused some eyes to be open on the state of U.S. bricks-and-mortar retail would be an understatement. Worrisome, to say the very least. In February, J.C. Penney (JCP - Get Report) announced a plan to shut down 138 underperforming stores. The store closures, which are poised to be completed by July 31, represent 13 to 14 percent of J.C. Penney's current store base and less than 5% of annual sales. J.C. Penney had said same-store sales at the targeted locations were "significantly below" the remaining store base and operate at a much-higher-expense rate due to poor productivity. The company is expected to gain some $200 million in annual cost savings from the closings. Fellow department stores Macy's (M - Get Report) and Sears Holdings Corp. (SHLD have continued to close stores in droves amid the shift to online shopping. Two of the most recent bankruptcy petitions came from specialty menswear retailer B&B Bachrach and discount shoe store chain Payless ShoeSource. Editor's Pick: Originally published May 8.